Officially, the name Tiffin came about when Josiah Hedges built the first frame house and saw mill on the east side of the Sandusky River in 1822. He decided to call his new village Tiffin in honor of the first Ohio governor. But Josiah wasn't the first settler to put down roots here. Long before Josiah arrived, there was a small community had developed across the river around the old stockade. This community became known as Fort Ball. It was the logical geographic location that was the primary reason for building the stockade called Fort Ball here during the War of 1812. It was just about 1 day's journey between Upper Sandusky and Lower Sandusky (now Fremont). One of soldiers that served at Fort Ball, Erastus Bowe of Virginia, noted the location of the fort would make a good place to build a tavern/inn for travelers using the new military road that had been painstakingly built through the dense swampy region during the war. As promised, Bowe returned to the site some years later and built his tavern. It was supposedly the first permanent log house built in Seneca County. The town of Tiffin was officially incorporated on March 7, 1835 and 15 years later Tiffin absorbed Fort Ball after 15 years of strife between the two communities. From the outset of the War of 1812, Northwest Ohio was under threat of invasion from the British, especially after the failures of American forays into British held territory around the Detroit area. Fearing reprisal incursions, General Harrison immediately began fortifying the northwest with a series of forts to help protect navigable waterways that included primarily the Maumee and Sandusky Rivers. The reason these waterways were so important is that the rest of the land was mostly swampy, and heavily wooded which made travelling by land almost impossible. Fort Meigs was the largest fortification on the Maumee River. There were also 3 fortifications built along the Sandusky: Fort Seneca, Fort Stephenson, and Fort Ball. These fortifications provided storage and staging areas to protect vital supply lines from the south. When Major Croghan refused General Harrison's orders to abandon Fort Stephenson when British forces threatened the position, Harrison sent word to Colonel Ball to immediately move to Fort Stephenson where he would relieve Croghan of his command. However, as Colonel Ball made his way to the fort, they could hear the cannon fire in the distance. By the time Colonel Ball reached the fort, the fighting was over with a smashing victory by Major Croghan. General Harrison then retracted his orders to relieve Croghan who later would receive a Congressional Gold Medal for his actions. Today there is an Ohio Historical Marker near where Fort Ball was located and the general area is referred to has the Historical fort Ball Neighborhood District. 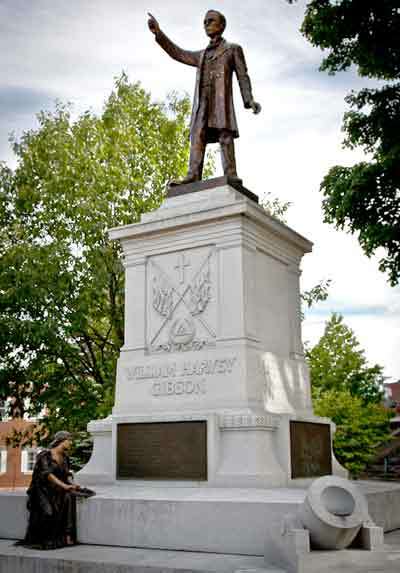 Located on the grounds of the Seneca County Courthouse is a large statue dedicated to William Harvey Gibson. Unless you're really up on your Seneca County history, you may not recognize the name. During his 72 years, Gibson became known as an eloquent political orator that had the physical ability to speak to extremely large crowds without the aid of any amplification. When Gibson was going to speak, people would come from great distances to listen to the man, regardless of the topic. Not only could he speak loudly, but he had a grand eloquence to his speeches that enamoured audiences to listen attentively for hours while he spoke. When the Civil War broke out, Gibson formed the 49th Ohio Volunteers. 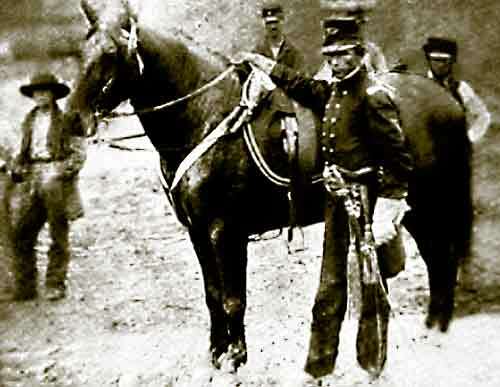 During the battle of Shiloh, he had 3 horses shot out from under him and received a bayonet wound during the battle. After recovering from his wounds, he went back to lead the 49th until the end of the war. After the war Gibson became a well known speaker across the country. He attended many veteran reunions as an invited speaker. He was also requested to help draw large crowds for office-seekers. Although Gibson was born in Jefferson County in 1821, his father purchased some 320 acres in Seneca County when he was just 4 months old. Gibson would remain a life-long resident of Tiffin until his death in 1894. Governor McKinley (future President) spoke at his funeral. General Gibson believed the two most important things in life were piety and patriotism. In his creed they were linked in indissoluble union. His piety was broad enough to include every creed, his patriotism wide enough to cover the whole country. He once said to me that he put the flag just beneath the cross. That, he said, was high enough for it. His name will be remembered as long as patriotism is revered.